HANDWRITING PENS Please can we remind parents that Key Stage 2 pupils should have a BLUE handwriting pen in their pencil case. We recommend gel pens as these flow easily, where as biros can impede your child’s handwriting. We recommend you label the pen with your child’s name. Gel pens can be purchased from any stationers or the office have now secured a new source which are available at a great price of 50p each. VYCES ROAD CLOSED Just to give parents advance notice: Vyces Road (opposite the school entrance on College Road) will be closed from 8 May for 36 days. This will cause congestion on College Road especially when the buses are dropping off / collecting. Please can we ask drivers to be considerate of the crossing patrol during this period too. Thank you. REMINDER NO CHOIR UNTIL 31 MAY Please can we remind parents that Key Stage 2 choir is not running again until Thursday 31 May, thank you. ART PROJECT VOLUNTEER HELPERS REQUIRED – Thursday 10 May The Year 4 children in class EM will be involved in a one day sculpture project at the end of May (see below). In preparation for this day some ‘plinths’ need to be made on which to display the sculptures. We are looking for some willing parents who would be able to come into school on Thursday 10 May for an hour or so, to help create these. They will be made from dental plaster mixed with gravel which will be poured into moulds to set. You do not have to be ‘arty’! If you can help, please speak to Miss Montague and Mrs Dwyer. ART PROJECT DONATIONS OF SUPPLIES STILL NEEDED For the Cathedral Art Project in May, we require a number of art supplies and hoped that families may have some of these items that they would be happy to donate to the project: bamboo garden canes; black emulsion paint; wire coat hangers; polythene sheeting/sheets; old salt and pepper pots; bits of lace. 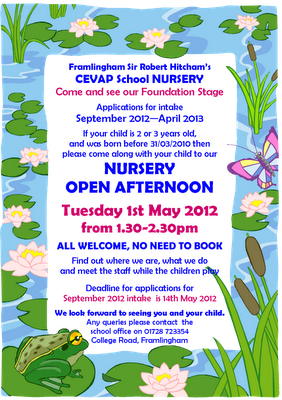 If you are able to donate any, please bring them in by Thursday 10 May. Thank you. BANK HOLIDAY – Monday 7 May Just to remind you all that next Monday is a Bank Holiday. Please note Violin lessons for that week will be held on Friday 11 May. Children from class KM (Reception) planting various vegetable seeds with Mrs Eyles. Finally place in our greenhouse. One of our year 4 children has brought into school an old bible given to her by her family. The writing on the first page shows that it was first given to her great grandparent in 1865. These super pictures (of their own houses) are by children in year 2. You can clearly see typical Suffolk architecture in some the drawings - pink and cream on the outside for example. A new after school club started this week. Our school has been given a plot on the new community gardens extension to the Framlingham Allottments. A group of 20 children (of mixed ages) went with Mrs Hopkins and Mrs Eyles plus some parents (Mr Seeley and Mr Duggans) who are involved with the Community Gardens project at Pigs Meadow. The first session involved some digging up of weeds and planting potatoes. The children also made some plans for future planting and growing. The deadline for returning your entry to the school office or Bill Bulstrode’s is this Wednesday - 25 April. The deadline for collecting these vouchers is 4 May, the collection box is outside the office. polythene sheeting/sheets; old salt and pepper pots; bits of lace. If you are able to donate any of these, please bring them in by Thursday 17 May. Thank you. Please find with this letter the latest Scholastic Book leaflet. Please complete and return to the office with payment by Monday 30 April. On Friday 20 April we were honoured to have a short visit from Dr Daniel Poulter MP. Sadly, there was very little time to speak with children, but he was impressed with the confidence of those he did see and the happy atmosphere in the school. He has promised to make another visit soon. We have had a big response to the gardening club letter sent last week and already have a waiting list of 12 pupils. We are sorry we are unable to accommodate any more. From 1 April the school cleaning will be carried out by SCC contractors, EFMS. Some of the current cleaning staff have transferred over to continue working with EFMS. After school, all teachers bring their classes onto the playground to meet their families. Any children not collected will then return to their class teacher who will take them to the office. If you allow your child to walk home we require you to sign the slip below and return it to the office please, else we will be unable to let your child leave school. IF YOU HAVE ALREADY ADVISED US OF THIS YOU DO NOT NEED TO DO SO AGAIN. These super photos were taken this afternoon by Mr Byer during the annual rugby tournament held at Hartismere High School. Robert Hitcham's team finished as runners-up in the tournament after winning 7 out of their 8 matches. Their only defeat was to the eventual winners: Debenham. On behalf of the Staff and Governors I would like to welcome all the pupils back for the summer term. We have some wonderful events planned this term for the Queen’s Diamond Jubilee and the London 2012 Olympics which I am sure the children will enjoy. 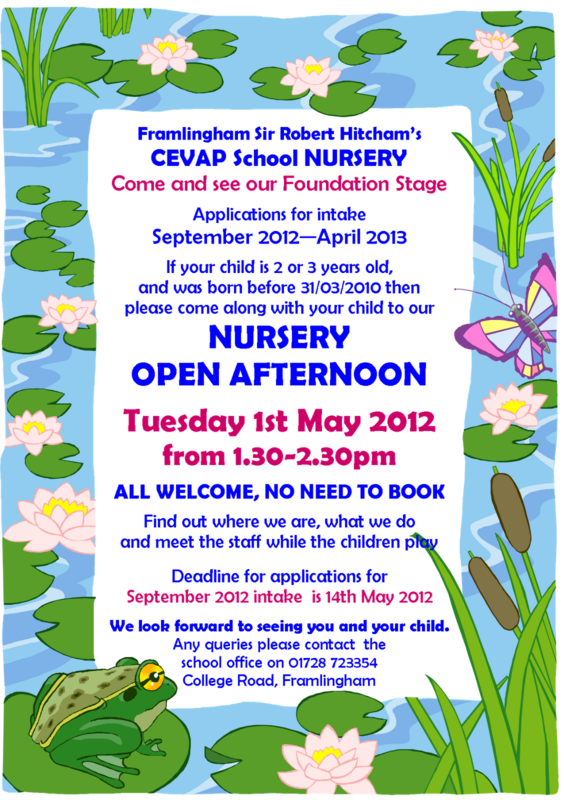 We have produced a separate leaflet with Diary Dates for the rest of this school year. It includes all the assemblies, share sessions, sporting events, Friends events and share sessions for the term. Please also note the section on club start dates and the 2012/2013 calendar. Now the summer term has started I wanted to remind you about our Sun Protection policy. The sun’s rays are particularly strong in the summer and they can damage children’s skin, which can sadly lead to skin cancer in later life. * encourage pupils to drink plenty of water to prevent dehydration. More details of these and other sun protection plans can be found in our Sun Protection policy. Of course, your support is very important if we are to make this work. * ensuring your child brings in a water bottle (with a sports cap). Visit www.wrapsplathat.co.uk for more information and a chance to win a holiday. However… as the British weather is so unpredictable can we please ask that children bring a waterproof coat with them as we still like them to go out at break and lunch times even if the weather is a little wet. Please note that all money coming into school should be in a sealed envelope, clearly labelled with your child’s name, class, reason for payment and amount. All money should be handed to the class teacher, and dinner money for the week must be handed in on a Monday, thank you. Cheques must also state your child’s name & class on the reverse please. The Friends would like to thank all the parents who helped on the night. The Friends are really pleased to let parents know that they raised £137.40, thank you to all who supported this event ~ baking or buying! Unfortunately, the repair work to the front reception roof has entailed more work than anticipated and it is likely that this entrance will be unusable until half term. Please can we ask that parents do not allow their children to ride scooters on the playground before and after school as there have been a few close accidents recently. A number of our Y6 & Y5 pupils took part in the inter-schools Cross Country at the end of last term. We are pleased to announce that Jake Seaber won the gold medal for the boys, Grace Berry gained silver and Zoe Hardy gained bronze for the girls, followed in fourth place by Ellie Pitcher. Well done to everyone who took part. We are pleased to announce that we have 4 new midday supervisors who will join our team. They are Mrs Mayhew, Mrs Freeman, Miss Martin & Mrs Mean-Roberts. We would like to welcome them to the school staff. On Sunday 29th April at 10.30am interested pupils (8-11 years) can sign on at Bedfield Little Green for a summer of coaching and games, coaching takes place on Saturday mornings.